Steve Largent was the ultimate fan favorite for the Seattle Seahawks, bursting onto the scene as a rookie in the franchise's first year of existence. 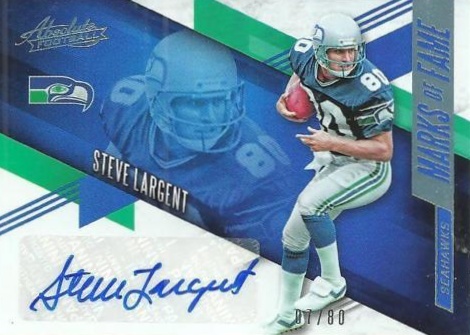 Some of the best Steve Largent football cards from his career are documented below as well as his notable autograph cards. Largent, a star college player at the University of Tulsa, would spend all 14 NFL seasons with the Seahawks. Although he was a smaller receiver, he was able to rack up incredible stats, including eight seasons with over 1,000 yards. At his retirement in 1989, he held the all-time record for receptions, receiving yardage, and touchdowns by a wide receiver. Following his time in the NFL, Largent had a successful career in the U.S. House of Representatives where he served from 1994 until 2002. Cementing his legacy, he became the first Seahawk elected to the Pro Football Hall of Fame. In addition, the Steve Largent Award was created by the team to honor players that exemplify team spirit, dedication, and integrity. 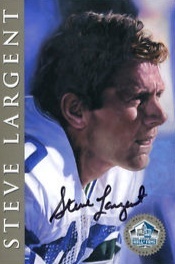 Shop for Steve Largent autograph cards on eBay. 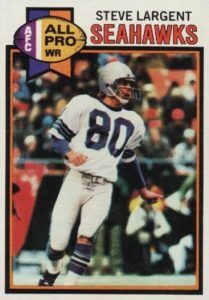 Although Largent's cardboard debut in 1977 Topps is positioned highly on the list, another '77 Topps release that is not featured is still worth noting. The Spanish-language 1977 Topps Mexican set is very rare in the same way the Venezuelan Topps Baseball cards are difficult to locate. Highly-graded versions of Largent's Mexican rookie can attract the highest prices for any of his cards. Interesting combination autographs featuring Largent include his 2005 Upper Deck Ultimate Collection appearance with Buffalo Bills receiver Andre Reed. In 2009 UD Ultimate Collection, he is paired on a dual autograph card with teammate Jim Zorn. For collectors interested in Largent's years at Tulsa as a Golden Hurricane, they can look to 2010 Upper Deck SPx Football, 2008 Donruss Classics, and a small 1989 Pacific set devoted entirely to Largent. Steve Largent is similar to players like Roberto Clemente or Roy Campanella in that their off-the-field community work, along with the on-field success, makes collectors proud to add them to their collection. In piecing together this list, card value was the main component along with card design and availability on the secondary market. Although Largent has a standard base card in the 1981 Topps set, it is his Super Action card that makes the cut. While most base cards were staged profile photos, Topps made an attempt to work in more action photography and the Super Action subset included the biggest stars of the day. You may also notice that Topps continued to airbrush helmet logos, making it difficult to know if Largent was being defended by a member of the New York Jets or the Philadelphia Eagles. 2013 Topps Archives Football included the Super Action design on some of the set's insert cards. A more recent choice, Largent was included in the 2016 Panini Absolute Marks of Fame insert that features many other Hall of Fame members. There are several low-numbered parallels but his jersey number edition is the most common at 80 copies. Largent is also found in the Historical Triples relic insert with Jerry Rice and Chris Carter. 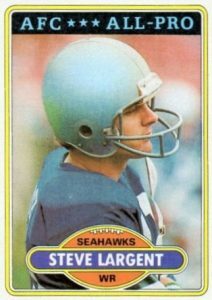 As previously referenced, many of Topps cards for Largent don't include the Seahawks logo on the helmets. However, the 1986 McDonald's set gives fans an opportunity to get a fully licensed card of Largent. Completists will want to track down the four different colored tabs which were released over the course of four weeks at McDonald's restaurants. The color variations started with blue, then moved to black, gold, and finally green. Attributed as a police card or a Coca-Cola card, this early Largent release displays a Coke logo and the Washington State Crime Prevention Association logo on the back. In total, there were 16 Seahawks in the set and each card features a football term and the definition. Largent's card offers the term "catch" and explains the football rules. It then adds that card collectors can help the police catch criminals. A particularly beautiful Steve Largent autograph was featured in 1999 Upper Deck Century Legends as part of the Epic Signatures insert. With a simple design and black-and-white photography, the set is famous for including many Hall of Famers from multiple sports. 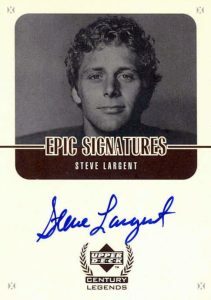 Largent's autograph is typically very readable and has some notable characteristics. This includes the way "Steve" is more closely spaced together than "Largent" and the "t" is crossed into the "S" in "Steve." 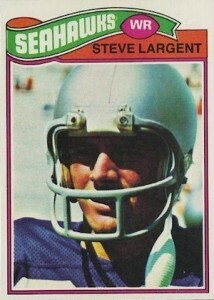 Largent was given the All-Pro designation on his 1980 Topps card and he would appear in seven Pro Bowls during his career. Although the Seahawks now play in the NFC West division, they were a part of the AFC West from 1977 through 2001 when the NFL realigned the conferences. 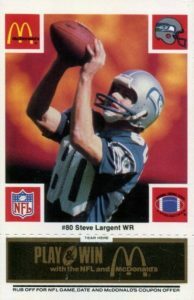 Largent's card again features a helmet without a logo because Topps did not have a licensing deal with the NFL. The other major football card producer, Fleer, issued several sets that had logos. But, because they did not have a deal with the player's association, they could not highlight individual players. My personal favorite Largent card comes from 1979 Topps and appears to show Largent open, waiting for a pass from then-quarterback Jim Zorn. Zorn and Largent were a great quarterback/receiver duo and their production together helped Largent set nearly every major receiving record. He became the first receiver to reach 100 touchdowns and set a record with 177 consecutive games with a reception. Additionally, Largent was featured on a receiving leaders card as well as a Seahawks team leaders card in 1979 Topps. For fans of art cards, the ultimate football set would be 1998 Hall of Fame Signature Series. The product was created and issued to raise money for NFL veterans that were having financial struggles. The original art was commissioned and many Hall of Fame legends, including Largent, signed 2,500 copies to be included in one impressive 116-card set. While many were split up, those rare intact sets still in the original packaging have topped $1,000 at auction. Largent's second-year card from 1978 Topps offers fans on a budget the opportunity to grab an early career appearance at a fraction of the price of his rookie card. Casual Seahawks fans might be surprised to learn that Largent was taken in the 4th round of the 1976 NFL Draft by the Houston Oilers and not Seattle. Picked by Houston and about to be released by the team, as the story goes, the Oilers decided to trade him to the Seahawks in what would become one of the worst trades in NFL history. 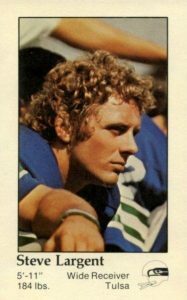 The first football cards with members of the expansion Seattle Seahawks were available in 1976 Topps. The cards showcased players selected in the expansion draft with each still wearing their former team's jersey. 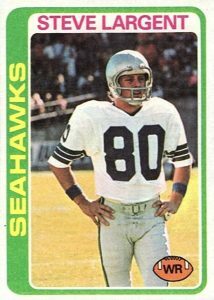 1977 Topps was the earliest set to feature actual Seahawks players and game stats with the new team, including Largent's famous rookie. 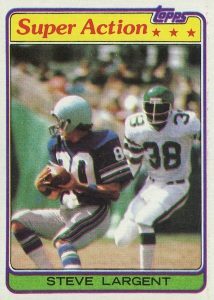 This Steve Largent card has become the most valuable rookie card from the '77 set and is only outpaced by Walter Payton's second-year card. Mint-graded versions can top $300 at auction.